Illustration of NASA's Low-Boom Flight Demonstration aircraft as outlined during the project's preliminary design review in 2017. NASA has selected Lockheed Martin to build the new supersonic jet. 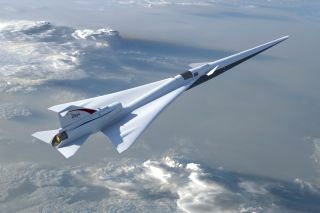 NASA has taken a huge leap forward in its quest to create an aircraft that can travel faster than the speed of sound without causing the ear-splitting sonic boom. The space agency announced today (April 2) that it has awarded the aerospace company Lockheed Martin a $247.5 million contract to design and build a new X-plane, known as the Low-Boom Flight Demonstrator (LBFD), which may soar silently over the U.S. by 2022. But don't expect to board a supersonic passenger jet anytime soon; Lockheed Martin's LBFD won't be built for transporting people. Before any supersonic planes will be allowed to fly over land, NASA and Lockheed Martin must prove that it's possible to break the sound barrier without the sonic boom. "This piloted X-plane would be built specifically to fly technologies that reduce the loudness of a sonic boom to that of a gentle thump," Jaiwon Shin, associate administrator of NASA's Aeronautics Research Mission Directorate, said during a news conference today. Shin added that the LBFD will fly over select U.S. cities starting in mid-2022 and NASA will "ask the people living and working in those communities to tell us what they heard, if anything." NASA will then send the "scientifically collected human response" data to the U.S. Federal Aviation Administration (FAA) and the International Civil Aviation Organization (ICAO) "so they can use the data to change the current rule that completely bans civil supersonic flights over land," Shin said. "When the rule is changed, the door will open to an aviation industry ready to enter [a] new supersonic market in our country and around the world," Shin said. "This X-plane is a critical step closer to that exciting future." The LBFD aircraft will be 94 feet (29 meters) long, or about the size of a small business jet. It will fly at a cruising altitude of about 55,000 feet (17,000 meters) and reach a speed of 1.4 times the speed of sound (about 1,000 mph, or 1,600 km/h). This will "create a sound about as loud as a car door closing," NASA officials said in the news conference. While NASA is working to reduce the sonic boom, other companies are working on their own supersonic aircraft designs — all of which will still create sonic booms during flight. Virgin Galactic has partnered up with Boom Technology to build a supersonic passenger jet called "Baby Boom" that could fly across the Atlantic Ocean at twice the speed of sound, cutting flight times in half. Those test flights are scheduled to begin in 2020. Another company, Spike Aerospace, aims to test its S-512 Supersonic Jet by the end of 2018.